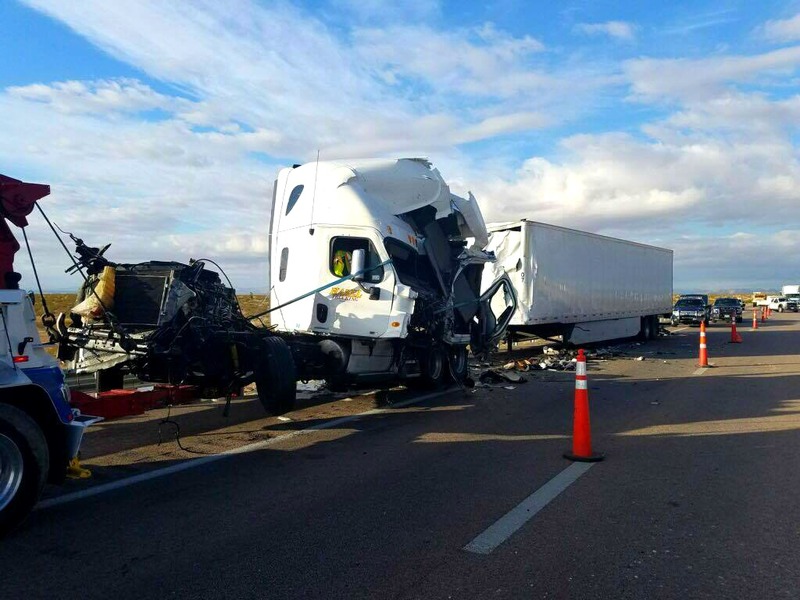 ST. GEORGE — One driver was seriously injured and flown to the hospital after two semitractor-trailers collided on Interstate 15 near Mesquite, Nevada, a crash that may have been triggered by an earlier accident early Friday morning. A few minutes before 4 a.m. PDT, officers and emergency personnel were dispatched to the crash on northbound Interstate 15 just south of mile marker 110, which left one injured driver trapped inside the cab of his truck, Nevada Highway Patrol trooper Chelsea Stuenkel said. “When this came in we were investigating another crash at mile marker 111 with traffic stopped,” she said. Officers responding to the crash found both trucks extensively damaged as firefighters began extricating the trapped driver, and Mercy Air was also dispatched to the scene. Stuenkel went on to say that both northbound lanes of I-15 were shut down to allow for a helicopter landing. Firefighters continued the complicated extrication that took additional time because of where the driver was trapped in the cab and the extent of his injuries, Mesquite Fire Department’s Public Information Officer Ryan Thornton said. “It required a pretty extensive extrication to get him out of that truck from my understanding,” he said. After firefighters were able to free the man, he was removed from the wreckage and flown to Dixie Regional Medical Center in serious condition. The driver of the second semi was transported by ambulance to Mesa View Regional Hospital in Mesquite in stable condition. According to witness statements, officers determined that the first semi was stopped behind numerous other vehicles when it was struck from behind by the second truck that was unable to stop in time to avoid the collision. The impact forced the undercarriage of the first truck forward until it separated from the cab, causing significant damage and leaving the driver trapped in the tangled wreckage. Both trucks were severely damaged and after several hours and multiple lane closures they were uprighted and towed from the scene. Thornton said that the first accident, reported an hour before, may have contributed to the tractor-trailers crash because traffic was stopped and backing up just prior to the two trucks colliding. The earlier crash involved a passenger car and a van carrying multiple occupants, he said, two of which were injured and later transported by ambulance to Mesa View Hospital with injuries that were not life-threatening, he said. Stuenkel added that the findings relating to the tractor-trailers crash are preliminary at this point, as the incident is still under investigation.